You know what they say about judging a book by it’s cover? This one has a fantastic cover so go ahead and judge it. To be honest, the title kind of threw me because it almost seemed like it was aimed at the prepper community. I’m glad I dug into it though because I was pleasantly surprised. Not that there is anything wrong with being a prepper, but Carol Deppe discuss much more realistic day-to-day issues that can derail your self reliance. It’s not exactly a reference book so I took the time to read it cover to cover. Reading anything can take me forever with our schedule so it was a miracle that I was able to finish this book. I’m glad I did take the time though or I would have missed what this book was really about and who it was aimed at (hint: it’s you and me). This book came at a great time. The economy had tanked and people were taking up gardening as a means of feeding themselves. 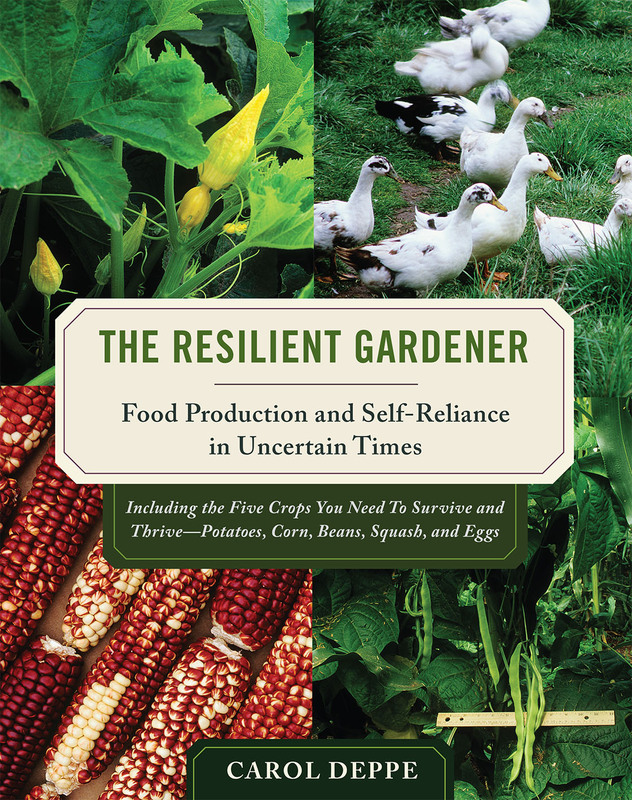 The author, Carol Deppe, is an experienced “market gardener.” Her book, The Resilient Gardener: Food Production and Self Reliance in Uncertain Times, focuses on four main crops and one livestock animal for the majority of one’s diet. She is also a plant breeder and sells some of her varieties. Ms. Deppe had some real life examples of why being resilient is important and not just in the end-of-the-world-as-we-know-it type of way. For example, when her mother fell ill and she had to care for her it made it nearly impossible for her to get out and tend to her garden. She relied on creating a resilient garden to get her through that period of her life. She also discusses having a bad back which makes many common garden chores, such as weeding and planting, difficult and painful. She has great advice on how to get around issues such as these to keep your garden going and being as comfortable as possible. In addition, she also talks about diet and exercise and how that can make you more resilient personally, not just as a gardener. Ms. Deppe suffers from Celiacs, which means she cannot eat foods that contain gluten. For her carbohydrates she grows corn and includes some delicious looking recipes utilizing this grain. She also explains the differences between the different types of corn. I had kind of any idea of the different types – dent, flint, sweet, popcorn, and flour corn – but she gives a great rundown of what makes them different from each other and what their best uses are. I think the main part that I don’t agree with is the way she waters. She doesn’t like drip irrigation because she says it’s too much work and instead prefers overhead irrigation and hand watering, which I think is way more work than automatic irrigation. Plus it wastes more water than drip irrigation. Otherwise I found this to be an incredibly informative book, including the best tools to use and where to get them and how to keep them in their best condition. The best part about this book? It’s not your typical gardening book that I feel is a topic that is just over-saturated. It goes over information that most gardening books don’t cover. It’s been a very long time since I’ve learned a lot of new stuff from a book. Fortunately this book met the challenge and succeeded. Loved this book. I bought it about 4 months ago and am very glad i did. I still plan to grow LOTS of things but may look to growing 1 or two big bounty things this year to see how it goes. Loved this book. I bought it about 4 months ago and am very glad i did. I loved her comparison of duck vs chicken eggs. I also loved her idea of community and how growing everything yourself is not sustainable OR community minded. If you grow four things and I grow four things and she grows four things we will have 12 things! Will check out this book. Found your blog last week. Always glad to hear about other families willing to learn to be more self sufficient. I congratulate you on your efforts. I’m hoping this idea, movement, whatever we want to call it will really catch on and be long lasting not just a fad. Continued success and fun!